As per usual, we were out and about in Portland with our friends Ben and Laura, aka the cutest photographer and health coach we know! We had long made plans to go to Bintliff’s for brunch since they had never been, but plans kept getting spoiled and it took us three weeks to FINALLY go! Thank God we made it! We decided to meet at 10 o’clock on a Saturday. This is just about the earliest any of us could muster the courage to go on a Saturday morning. When we go there, there was quite a line that had formed, but the good people at Bintliff’s, knowing people in need of caffeine are about one second away from a minor riot, had mugs and coffee available while we waited. Nice, crisis averted! While we stood there, Ben and Laura told us that the hostess had estimated a 20 minute wait. Not too shabby, so we all gladly chatted, got caffeinated, and Ben nursed his small hangover from a pub crawl the evening before. No sooner had we caught up on life then we were taken upstairs to our table. At the top of the stairs sat my friend, Laura, creator of the amazing street style blog Fore Front Fashion! So, obviously, Bintliff’s is the place to be on a Saturday for brunch! We sat down and Ben and I decided to get their much talked about Bloody’s. My were they spectacular! Just the right amount of spicy horseradish and a salt and pepper rimed glass. Ben immediately started feeling the effects of the “hair of the dog” and was ready for a hearty breakfast! Bintliff's Amazing Bloody. 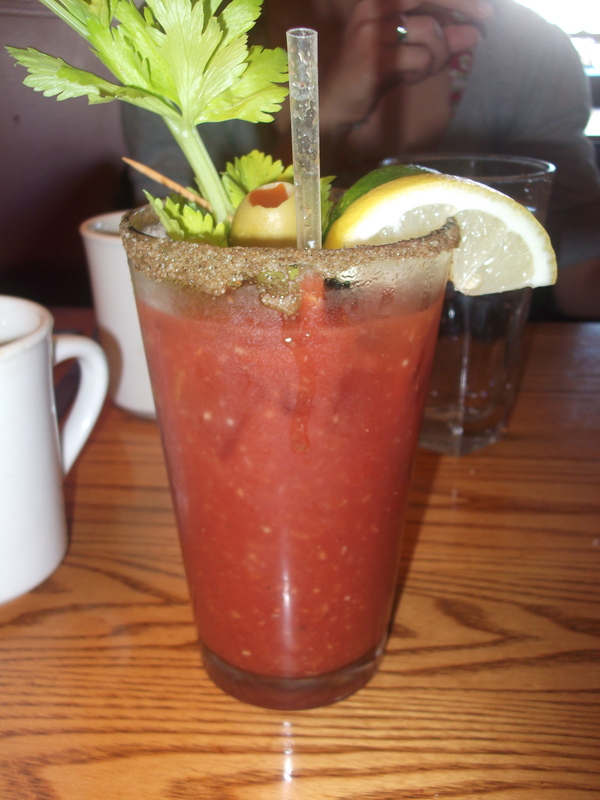 The cure for the common hangover. 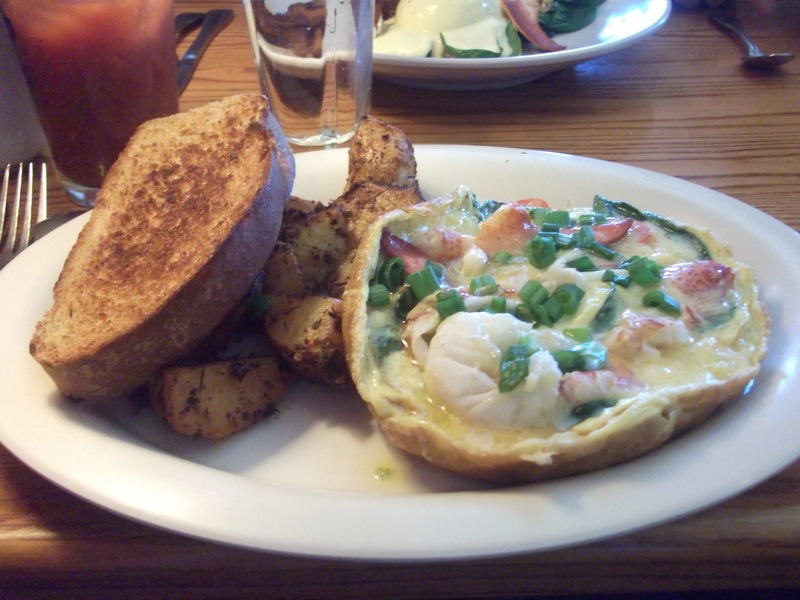 and I ordered the lobster frittata with gruyere cheese, spinach, and tomatoes. Yum-O. 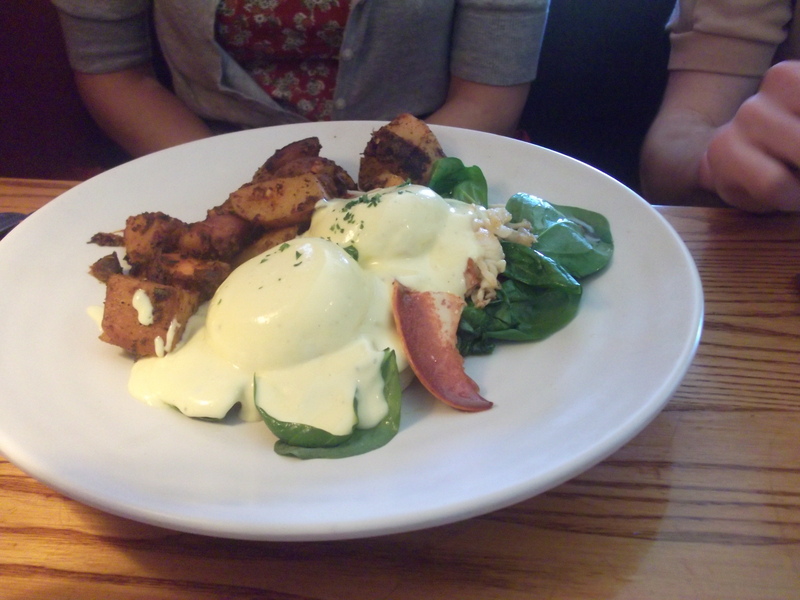 Both of our lobster breakfasts came with a hearty portion of lobster, it was very fresh and delicious! 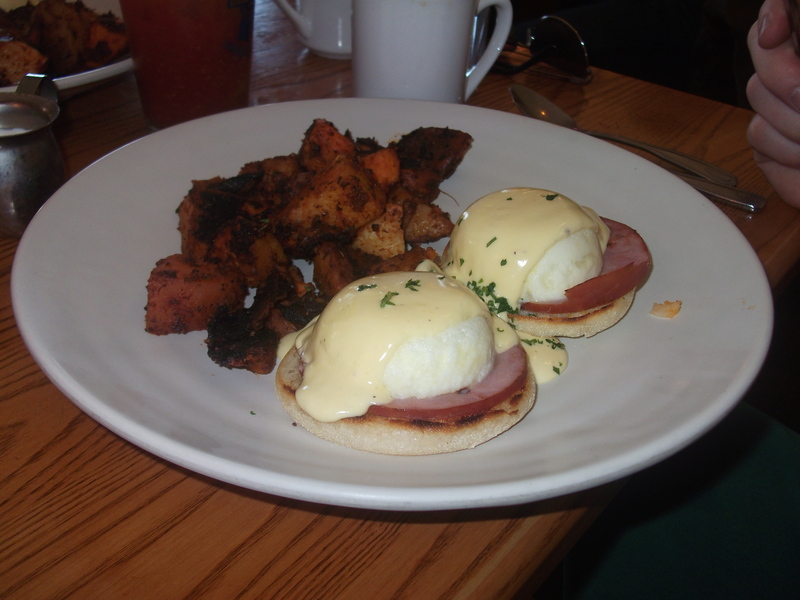 Mark and Ben were feeling rather plain and opted for the regular Eggs Benedict. It wasn’t long before huge plates piled high with homemade potatoes (both russet and sweet) fried to perfection came out along with our beautiful egg plates. Overall, it was a great brunch with great friends. My husband, Mark, thinks they have the best eggs benedict in town! Unlimited cups of coffee are $1.99, bloody’s are $6.99, the lobster dishes were $14.99, and the plain benedict’s were $11.99. So, reasonably priced for the large amount of food you get. We left there so full we didn’t eat until 6:30 p.m. Now that’s what I call a hearty brunch! Sometimes living so far from the boarder of Mexico makes me crave stuff that I know I just can’t have…like a real enchilada or chili poblano. So in order to satisfy these cravings (and they are sooo strong) I figure I either a) Move to Southern California or b) learn to cook some Southwestern style, Latin inspired dishes. WARNING: This version is going very Americanized as I was only using what was in my house this morning! Preheat the oven to 350º. Grease an 8 x 4 baking dish and layer with one cup of your desired cheese. Beat eggs and add a dash of milk. Salt and pepper the eggs. Add a dash of hot sauce. Beat again to mix. Pour over the cheese. Add corn, pico de gallo, and red pepper (you can also add diced onions or garlic if you wish). Mix together with a fork to blend all the ingredients together. Now bake it for 45-55 minutes. IT’S THAT EASY! Enjoy, and don’t forget, Eat here. Go there.